(Release Date: October 7, 2014)  The fanciful, enduring fairy tale of a newborn baby cursed by a vengeful sorceress named Maleficent (voiced by Eleanor Audley), "Sleeping Beauty" basically defies critical reaction. Like "Snow White and the Seven Dwarfs," "Bambi" and "Cinderella," it is a part of Disney's proud, illustrious animated history and engrained in most people's childhood nostalgia. Based on French writer Charles Perrault's "La Belle au bois dormant" in 1697, and later adapted into the Brothers Grimm's famous fairytale "Little Briar Rose" in 1812, "Sleeping Beauty" pits an engaging protagonist16-year-old royal daughter Aurora (voiced by Mary Costa), destined to perish after pricking her finger on the spindle of a spinning wheelagainst one of the all-time great villains, the witchy, shape-shifting Maleficent. The film, directed by Clyde Geronimi, is resplendently animated, lovingly scored (the song "Once Upon a Dream" is sheer magic), and unspools with gentle sweetness and a dollop of underlying darkness and foreboding. A vision of artistry and pure entertainment, "Sleeping Beauty" will never, ever grow old. Out of print for over four years, "Sleeping Beauty" is back on the market in high-definition with Disney's "Diamond Edition" Blu-ray. The 1080p transfer is a hold-over from the 2008 "Platinum Edition" Blu-ray, but there is nothing wrong with that. This 1080p picture, offered in its 2.55:1 aspect ratio, is a stunner that makes its 55-year-old source material look new and vibrant again. The widescreen canvas of its lovely hand-drawn animation does not waste an inch of its frame, while print damage and errant dirt and specks are kept to a bare minimum. Vibrant and razor-sharp, the level of detail will be revelatory for those viewers who have never seen this particular film in high-def. The 7.1 DTS-HD Master Audio is also the same track used on the 2008 Blu-ray, but it is as radiant as the picture quality. Dialogue is clear, music is robust, and the sound mix handily immerses its audience into the fantasy world of Aurora and Maleficent. 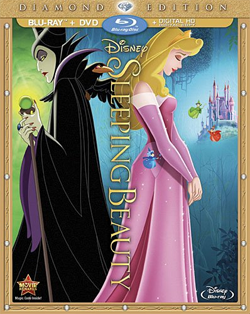 Bonus content previously featured on 2008's 50th Anniversary Platinum Edition Blu-ray of "Sleeping Beauty:"
Brand-new bonus content featured on Disney's Diamond Edition Blu-ray of "Sleeping Beauty:"
What can be said about "Sleeping Beauty" as a film and historical watermark other than that it is a timeless classic? One of Disney's best animated features from the studio's formative golden age, it continues to bewitch audiences of all ages during every generation, and there is no better way to see it than on Blu-ray. Here is the conflict: if you already have the earlier 2008 "Platinum Edition," the only difference is a few additional new special features. Unfortunately, you also lose a handful from the previous edition. For major fans, Disney's new "Diamond Edition" Blu-ray might be worth the double-dip, but hold onto the other release. For those that missed out on the 2008 release before it went back into the studio vault, now is your second chance to own a copy. Everyone else, you are probably good at just keeping the "Platinum Edition" and calling it a day.